How old is your house ? This may seem a straightforward question and one that should have a simple answer. But houses can be complex structures in an area with a long history. And once you start looking into the past you can uncover fascinating stories. The most obvious sources of information can often be the most useful and entertaining. Chatting to the neighbours can provide you with some local history (though allow for some poetic license) and the estate agent who sold you the house may know a considerable bit about its history. The solicitor who handled the conveyancing may also have turned up interesting information during the searches. However, there is no quick and easy way of discovering the history of a house and it is often not possible to date old houses very precisely from records which survive. It is probably best to work backwards from the known to the unknown. The main sources of information described here are maps, estate records and the external and internal architecture. A useful exercise is to locate your house on a map and to trace it back as far as possible. The Heritage Bank has already assembled maps of Buriton for 1793, 1840, 1870, 1897 and for early in the 20th century. 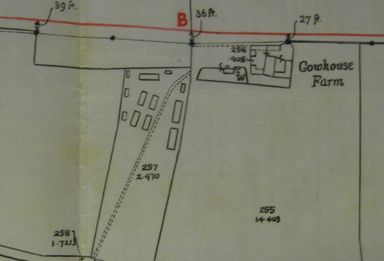 The County Records Office also has copies of written documents that accompanied maps. 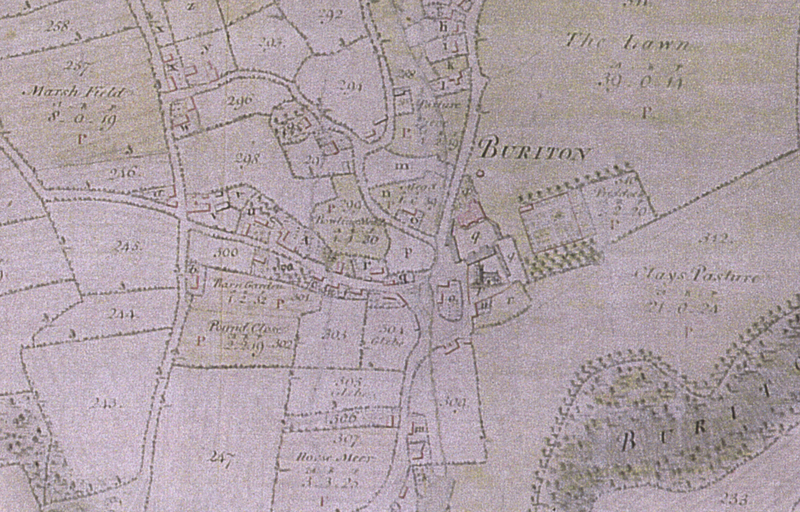 The Tithe Awards which accompanied Tithe Maps listed the owners and occupiers of every plot of land or dwelling shown on the map, giving a brief description of the property and the rent that was fixed by the Tithe Commissioners. The first edition of a large scale Ordnance Survey map dates from about 1870 and subsequent editions were produced in 1897, 1910, and 1932. These all provide valuable starting points as they are accurate and show almost all buildings. A comparison of maps from different dates may indicate changes to the size, shape, name or number of houses and alterations to the land around houses may also be shown. Even if your house dates from an earlier period, you may learn something from these maps. If a house has been part of a large estate it may be referred to in the records of the administration of the estate. 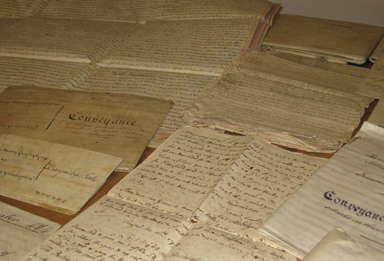 The records of many Hampshire estates are kept in the County Records Office in Winchester and often contain rentals, surveys, leases, tenancy agreements, sales particulars, accounts, correspondence and maps which may all provide information on local houses and farms. The records may not always identify properties individually but this can often be rectified by consulting accompanying estate maps. 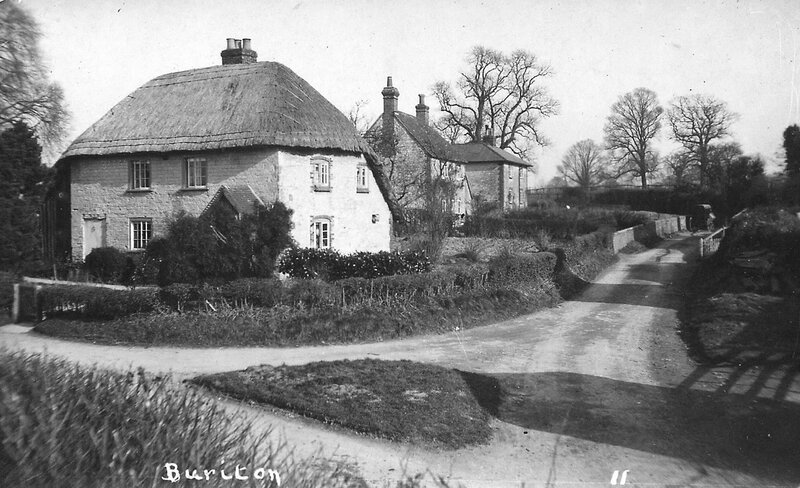 The most useful estate records for the parish of Buriton are those of the Legge Estate and the Bonham-Carters. The architecture itself is one of the most valuable sources for determining the age of a house. The layout of the property, building materials, windows, roof timbers and chimney stacks may all give clues to the date. There are, however, traps for the unwary: older features may be hidden by later improvements, and date-stones sometimes relate to alterations or additions rather than to the overall structure. External and internal inspections are good starting points. Walk around the building, about 15-20 yards away, and observe all structural and decorative features. Of particular significance are the windows which can give good clues for dating. Note the roof structure and choice of materials; is it pitched, hipped or gabled? Note any decorative finials and other features of interest such as gutters and downpipes. The external appearance of the walls is obviously a key feature. What are they made of? What sort of pointing has been used? Look for external alterations, extensions, blocked or later windows or door openings, all of which give clues to the evolution of the building. Inside the house, start exploring in the roof-space, which often reveals clues about the house because it is one part of a building that is rarely altered. The chimney stack in the roof space can give valuable clues as to room layout and use, and even the connection with a neighbouring building. If the house has been extended to roof level, the changes in the roof structure will be apparent. Within the body of a house, the internal layout and any alterations will give clues to the original functions of different rooms and to changes in use through history. Look for signs of blocked doorways (changes in skirting boards, picture rails or cornices), new doors, evidence of removed walls (boxed in supporting joists) and removed chimneys. Areas of most change are likely to be domestic areas such as kitchens and sculleries. The functional and decorative internal features are crucial for dating and analysing a house. Fireplaces are a helpful means of dating a house, and are often concealed behind a 20th century addition or amendment. Are the doors original or later replacements? Early wallpaper can often be found in attics or in cupboards and can give interesting insights into early designs. It is a good idea to make a record of all the details you observe as this will encourage you to look with attention at details which you might otherwise miss and can help to build up a coherent picture of the whole building. It can be fun to go round with a partner; one person on their own is more likely to miss something. Work systematically from left to right and clockwise. Take photographs of interesting details. Pace out rooms and sketch rough plans of each floor of the house, remembering to show wall thicknesses. Measure ceiling heights and note any changes in floor levels. Your observations, notes, sketches and photographs will help you think about the overall layout of the house. Is it one unified design or a combination of bits and pieces? Which parts are likely to be the oldest? Was it originally one house or more? And you will have information to show to others with more specialist knowledge. Some of the books referred to on the back page of this leaflet provide further advice and guidance. Three main sources of information about previous occupants are suggested here: title deeds, census’ and electoral registers. But the Estate Papers referred to above can also be valuable. 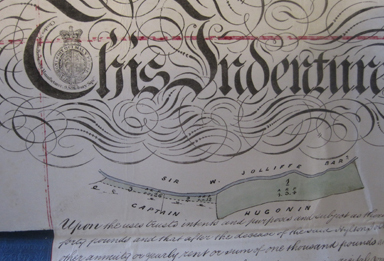 One of the first steps in tracing the history of a house is to read the title deeds, if you have access to them. They may be with a solicitor or building society. If you are lucky, they may include documents from the time that the land was first purchased, and they may give you the names of successive owners. Sometimes deeds recite sections of previous deeds (in the ‘whereas’ clauses) and abstracts of title often provide a summary of the main events, sometimes going back further than the earliest surviving deeds. In villages such as Buriton and Weston where many properties have been part of large estates, it is possible that some deeds may include details for other houses. Some probably go back over a hundred years. 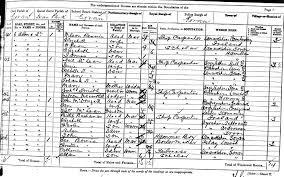 The census returns of 1841, 1851, 1861, 1871, 1881, 1891, 1901 and 1911 can be useful for establishing whether a property was already in existence at the time of a particular census, as well as providing details about the occupants of the house. They can be a particularly fertile source of information giving an insight into the number of people living in each house, their ages, relationships to each other and occupations. However, census returns often lack a sufficiently precise description to enable you to identify your own house and so names gleaned from other sources (eg, tithe apportionments, title deeds or electoral registers) can be very helpful. Any street numbers should be treated with caution as numbering has often changed over the years and numbers on the census returns may only refer to the enumerator’s survey. Electoral registers are available in public libraries and Records Offices from about 1896 to the present day. They provide names and addresses of electors in each parish but remember that not all men were included until 1918 and some women had to wait another ten years before they were included. Nonetheless, the registers can help fill in parts of the picture – particularly for most of the 20th century. Rate Books: it is sometimes possible to trace a property back through rate books, which list all the contributors to a particular charge. Parish poor, church and highway rate books mainly date from the 18th and 19th centuries but some have survived from before then. Inland Revenue Valuation Records: these records were created as a result of the 1909-1910 Finance Act and formed part of a national survey of land ownership. The valuation books give the names of owners and occupiers, usage and extent of land, and a map reference. Land Tax Assessments: land tax was introduced in the late 17th century and finally abolished in 1963. Surviving assessments usually give the names of owners and occupiers, a description of the property and the amounts of tax levied. Very often houses are not described very precisely and so it is best to work backwards from known information. Hearth Tax: between 1662 and 1689 a tax on hearths was imposed and the returns list all householders liable to pay the tax (and the number of hearths they had). Properties are not named and so these records can only really be used for tracing the history of a house when the name of the owner or occupier is known. Manorial Records or Court Rolls: transfers of land from one person to another (for sale or inheritance) used to have to take place in a manorial court. Such transactions were written in the court books and it can be possible to trace the holders of an individual property. Manorial surveys, which were often drawn up when estates were about to be sold, can also be useful. They are accounts of deeds, usually with the names of owners, occupiers etc. 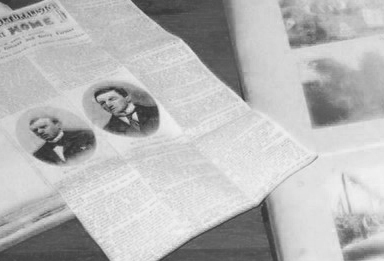 Other records which might provide useful sources of other information include old sale particulars and newspapers, wills and inventories, business records, directories and special sources for public houses, parsonage houses and schools. Locate your title deeds and read them. They may include documents from the time that the land was first purchased, and they may give you the names of successive owners. Look at old maps to see how far back your house goes and what sort of area it was in. Look at old census returns to find out about the occupants of the house, their occupations, ages, and their relationships to each other and to nearby families. Look at the front exterior of the house and spot the general style: Georgian, Victorian etc. Look at the position of chimneys. These are often clues to the date and history of a house. Compare the front of the house with the sides and back. If they are different there is a strong chance that it is an early house marked by later changes. Make a plan of the general layout and think about how it could have been put together. Is it all one unified design or a combination of bits and pieces ? Look at the internal fittings: doors, windows etc. These will often have been changed but, equally as often, tell-tale hints or fragments of earlier features will remain. Hunt them out. Go into the attic and look at the roof space. Since this is a hidden area, many older features, including the roof timbers themselves, will be left and not replaced or masked. Share the information that you find with others. They might be able to solve your puzzles.